Caprese’s are probably one of my favorite types of (unhealthy) salads! They combine some of my favorite ingredients, cheese (mozzarella to be specific) tomatoes, basil, and balsamic vinegar. The only way to make this dish even better, & slightly unhealthier, is by breading & frying the free mozzarella cheese! 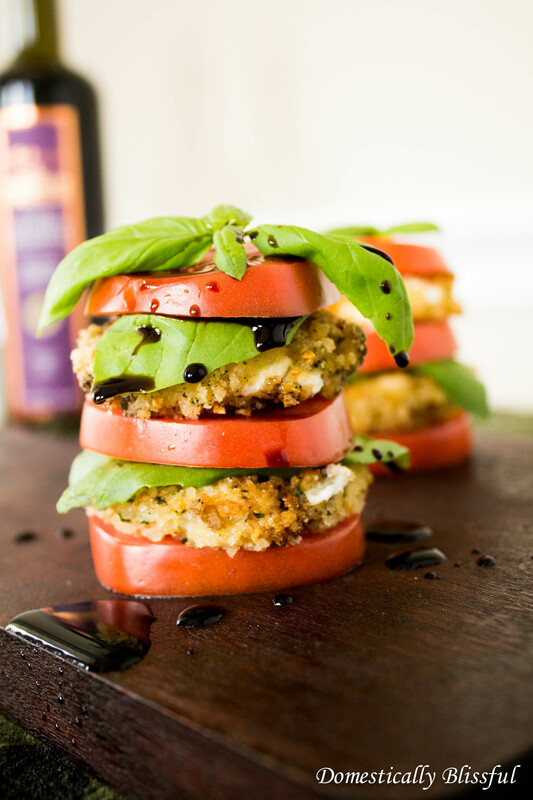 I know this Fried Mozzarella Stack might sound a little crazy, but oh my is it delicious! 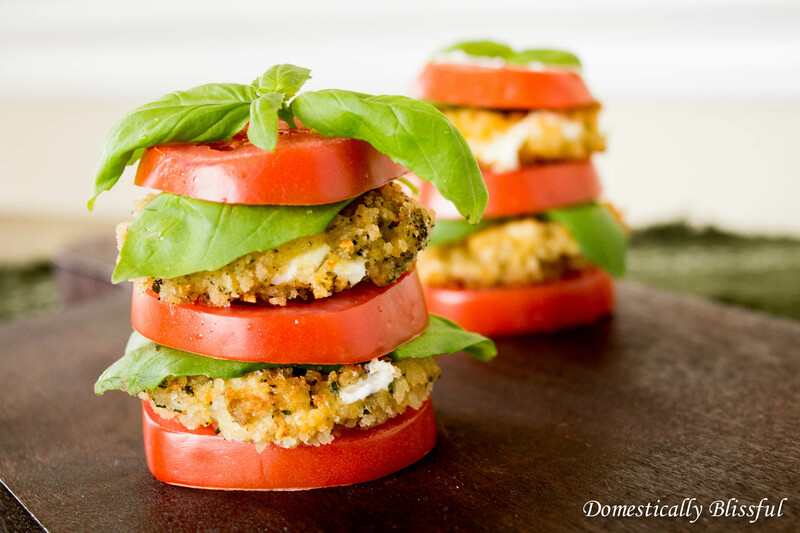 This stack is the perfect combination of fresh tomato & basil combined with the warm and melty mozzarella cheese. 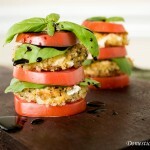 My mouth waters just thinking about this Fried Mozzarella Stack! We might have to buy more mozzarella just to fulfill my cravings. Hopefully it will be on sale at Publix very soon because I seriously can’t stop thinking about the fresh melted mozzarella cheese covered by the crunchy breadcrumb crust. 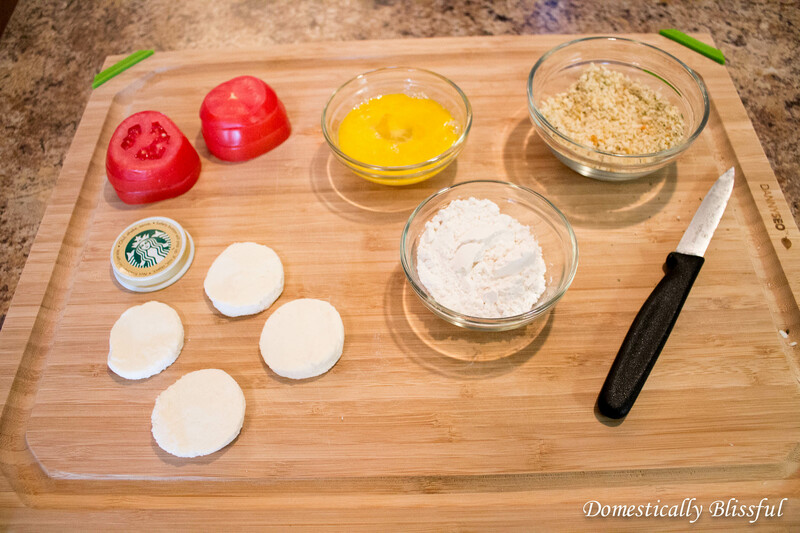 First, cut the tomato and the mozzarella cheese so that they are the same size and thickness. The tomato I used was skinny and tall so I was able to make two stacks out of one tomato. To cut the mozzarella cheese I cut a slice of fresh mozzarella and then used a clean Starbucks Frappicino lid as a cookie cutter to make them the size I needed. In a small bowl scramble one egg, place 1 heaping tablespoon of flour in another small bowl, in a third bowl mix together ½ cup breadcrumbs, 1 pinch salt, 1 pinch black pepper, ¼ teaspoon dried basil, and ¼ teaspoon dried parsley. Now to bread the mozzarella cheese. 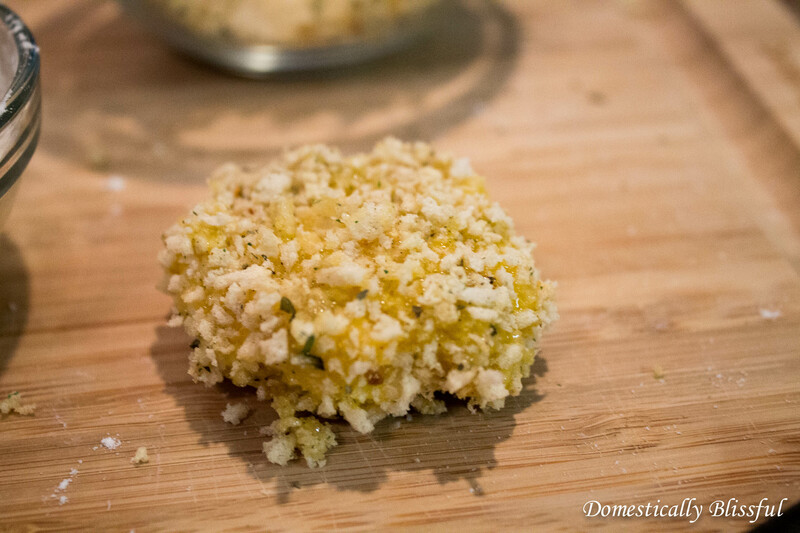 First, take one slice of mozzarella coat it in flour, and then dip it in egg, and then in the breadcrumbs. Then dip the whole thing in the egg again and in the breadcrumbs a second time. Repeat this process until all of the mozzarella slices are coated. Next, pour your oil into a small pan (I used an egg pan) so that it is half the depth of the cheese slices. Turn the heat to medium. Once the oil is hot fry the cheese for 1-2 minutes until golden brown on each side. Place the fried mozzarella on a paper towel to remove any excess oil. *Be careful with the hot oil! My oil was too hot the first time and I burned the cheese and created a huge ball of smoke in our house! 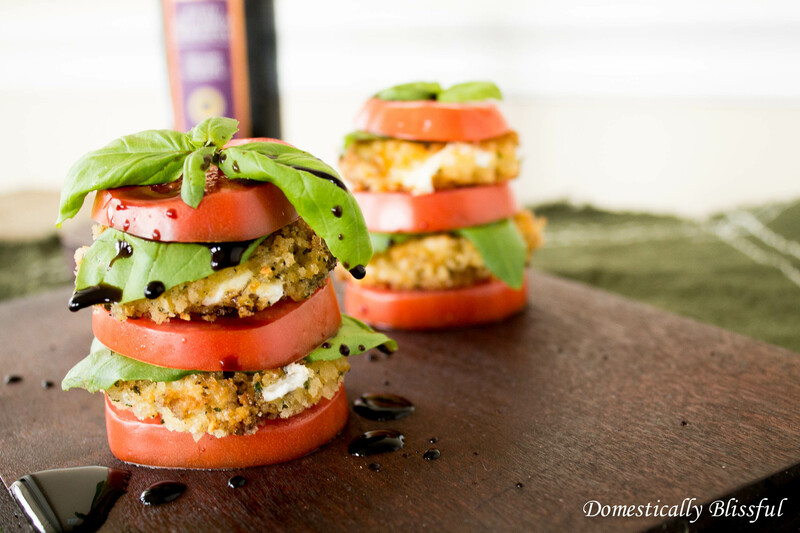 Layer your Fried Mozzarella Stacks with the tomatoes, mozzarella, and basil leaves, and pour the balsamic vinegar on top. Next, pour your oil into a small pan – I used an egg pan – so that it is half the depth of the cheese slices. Turn the heat to medium. Once the oil is hot fry the cheese for 1-2 minutes until golden brown on each side. Place the fried mozzarella on a paper towel to remove any excess oil. 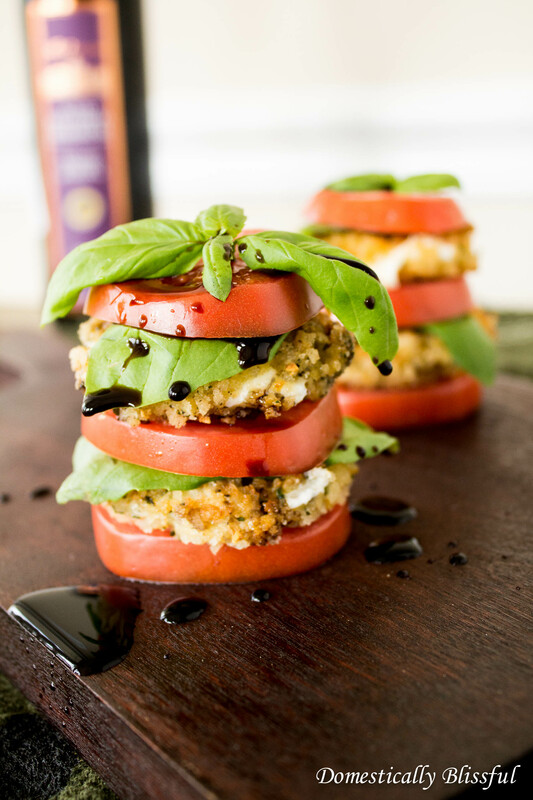 This Fried Mozzarella Stack is seriously so good! 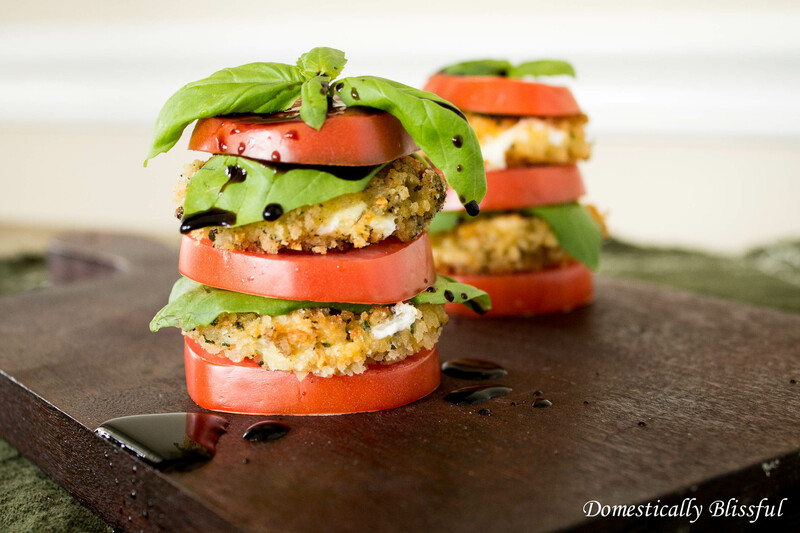 What is your favorite way to enjoy caprese?